Just a 10 minute drive from Saint Petersburg Clearwater Airport, this Florida hotel features a continental breakfast, outdoor pool, and indoor hot tub. Guests are 14 miles from pristine Clearwater Beach. A microwave, small refrigerator, and flat-screen cable TV is included in all guest rooms. Select rooms at LaQuinta Inn and Suites Clearwater South feature a sitting area with sofa bed. Guests at this Clearwater South LaQuinta Inn and Suites will have access to free property-wide Wi-Fi, a 24-hour business center, and fitness center. A 24-hour front desk is available as well. The Great Explorations Children's Museum is a 15 minute drive from the property. Clearwater Guests are a 20 minute drive from the Harborview Center and Jack Russell Stadium. Located just 3.7 miles from Saint Petersburg Clearwater International Airport, this hotel features an outdoor swimming pool and daily continental breakfast. Free Wi-Fi is available. A microwave, refrigerator and coffee-making facilities come standard in each room at Express Inn and Suites Clearwater. A cable TV is also included. Free parking is available on site at Clearwater’s Express Inn and Suites. A 24-hour reception is included for added convenience. Clearwater Beach is 18 minutes’ drive from this hotel. Guests will be 13.7 miles from Saint Petersburg city centre. Located in Pinellas Park, Florida, this hotel offers an outdoor pool, cozy library and rooms equipped with free Wi-Fi and a 32-inch LCD TV. Pier Aquarium is 9 miles away. Country Inn Pinellas Park offers a microwave, refrigerator and a coffee maker in every room cable TV and a work desk are also included. Guests can work out in the gym or use the business center. The hotel serves a daily continental breakfast in the dining room while fresh baked cookies and hot coffee are available in the lobby. Country Inn & Suites By Carlson, Pinellas Park, FL is within a 20-minute drive of Baywalk entertainment district and Madeira Beach. Tropicana Field is a 15-minute drive away. This Pinellas Park, Florida hotel offers an on-site Mexican restaurant, an outdoor pool and rooms with free Wi-Fi. Lake Seminole Park is just 7.5 miles from this hotel. A coffee maker, cable TV and a hairdryer are provided in every room at Pinellas Park Budget Inn. An in-room safe and work desk are also offered. Guests can use the business center or the laundry facilities located on site. Free parking is provided. Budget Inn of Pinellas Park offers a continental breakfast each morning. Tropicana Field and the Sunken Gardens are both a 15-minute drive from this hotel. MacDill Air Force Base is 30-minute drive away. 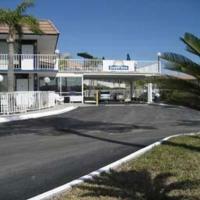 The La Quinta Inn Tampa Bay Pinellas Park is located just 20 minutes’ drive from St. Pete Beach. Guests can take a swim in the outdoor pool and have a hot continental breakfast during their stay. Free Wi-Fi and cable TV are included in each of the rooms of this Clearwater hotel. A hairdryer is provided in the bathroom and rooms also have a seating area. A launderette and meeting facilities are available to guests of the Clearwater La Quinta Inn Pinellas Park. This is also a pet-friendly hotel. The property is 15 minutes’ drive from the Salvador Dali Museum. St. Petersburg city centre and the pier are 8 miles away.